My gates are route markings. Sometimes they mark imaginary tracks that lead up to or away from them. You can pass through the "Hannover Tor / Hanover Gate" or walk round it. - You can thus experience the interior and the exterior of the gate´s space step-by-step. The combination of walking and looking makes the observer an observer-actor and reveals to him step-by-step the interaction between the forms and the meaning of the whole. The gate´s passage space is therefore transformed into a spce to linger and a place of contemplation. The Hannover Tor / Hanover Gate is mentioned in a compilation by the RuhrKunstMuseen on "Public Art Ruhr"; click here for the entry. It is also mentioned in the compilation Kunst im öffentlichen Raum / Art in Public Spaces in Nordrhein-Westfalen; click here for the entry. 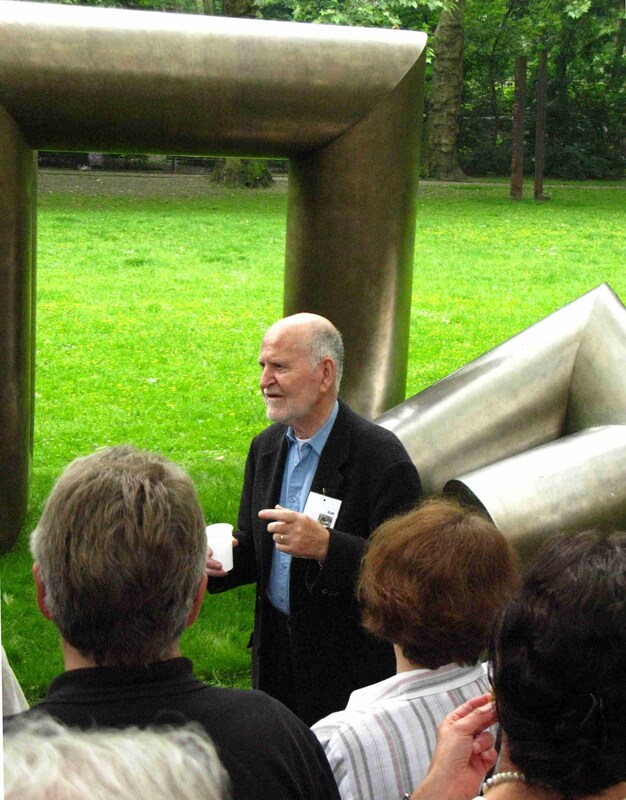 On 22 Nov 2008 and 25 April 2009 Friedrich Gräsel opened his studio for a group of KaM members; more about those visits here. On 13 Dec 2014 the three sons of Friedrich Gräsel opened the studio and store rooms of their late father (who passed away in 2013) for members and supporters of the association KaM, explaining and bringing to life the works stored there and available as part of their father´s oeuvre. Among others, a model of the Hannover Tor / Hanover Gate was on display. More about the visit here. Stainless Steel sculpture "Schiffsketten / Ship´s Chains" 1972; outside the Museum Folkwang, next to Goethestrasse. West of the Moltkeplatz, approx 2.200 m by foot (map from Moltkeplatz to the Museum here, coordinates: 51 26 29,64 N 7 00 12,51 E); the sculpture consists of two parts, dimensions are 120 x 120 x 280 cm, and 120 x 120 x 490 cm. The Museum Folkwang is the southern-most end of the City of Essen Kulturpfad / Culture Trail. The trail is marked by blue glass tiles set into the ground.